Huawei's innovation abilities are sustainable thanks to its long-term investment in research and development (R&D) and focus on developing talent from across the globe, which can potentially lead to a Nobel Prize, an industry representative told the Global Times on Wednesday. "Huawei's innovation capabilities are great and substantial because they have unabatedly invested in R&D and are now attracting talent from various parts of the world," Stéphane Téral, the executive director of research and analysis and an advisor for IHS Markit Mobile Infrastructure and Carrier Economics, told the Global Times on Wednesday. Téral, with 28 years of experience in the telecommunications industry, noted that although major players in this field - Huawei, Sweden's Ericsson and Finland's Nokia - all have unique innovation attributes, the Chinese company appeared to move "a bit ahead" of its rivals in 2017. Since then, the other two players have caught up, especially on massive multiple-input multiple-output antennas, he said. While looking into this comparison in terms of contributions to industry standards, "Huawei is ahead of Ericsson, followed by Nokia," he said. The Shenzhen-based technology company spends $15-20 billion annually on R&D projects, putting it among the world's top five companies for R&D investment. "This focused approach to investment has helped us succeed," Ren Zhengfei, the founder of Huawei, said in an interview in February. The company's innovation abilities also help drive the industry's growth, especially in the 5G era. For instance, the company's 5G radio access network is driving fast 5G deployment through unique innovation and technology breakthroughs. It won an award for being the best mobile technology breakthrough from global industry body GSMA during the MWC2019, an annual industry event, in February. The technology demonstrates a good way of lowering the cost of 5G deployment and increasing capacity and coverage, especially with the reuse of existing hardware, and existing along with new spectrum, according to the judges' comments. As some carriers have used Huawei's equipment in the 3G and 4G networks, it will create a vacuum if they stop using the company's products in the 5G era. Doing so would also cause a financial burden on the carriers, an industry representative who works at a major carrier in China told the Global Times. Foreign carriers have also recognized the innovation capability of the Chinese company, and teamed up with Huawei to tap into more network usage. 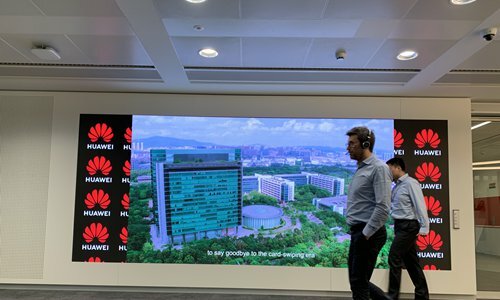 South Africa-based multinational carrier MTN Group signed a framework agreement with Huawei for innovation during the MWC2019. "I'm sure Huawei is a very capable company, and they're having success in certain markets that they're in," Robert Boyanovsky, vice president of Enterprise Mobility at AT&T Business, told the Global Times in an interview during the MWC2019 in Spain. If Huawei is introduced to the US market after the geopolitical spat is resolved, AT&T will study the products of the Chinese company, Boyanovsky noted. "The company has, I believe, 12 fellows among its 180,000 employees who eventually can become Nobel prize candidates in physics," Téral said, referring to Huawei's pursuit of top talent. Huawei fellows are scientists and researchers in the company that make significant contributions to its R&D. "Huawei's innovation capabilities can potentially lead to a Nobel Prize," he added.